What Metal Products Can Be Recycled? These days, everything is recycled. Metal is certainly no exception to this rule. However, just because some metal can be recycled doesn’t mean that all metal can be recycled. There are certain metal products which are not capable of being recycled. Maybe you’ve got some metal products that you’re wanting to recycle, but aren’t sure of whether or not it would be appropriate? We’ve created a list of the most commonly recycled metal items so that you can dispose of your waste in the correct manner. We doubt that there’s anyone in the United States who doesn’t know that pop cans can be recycled. In fact, many individuals have been recycling their pop cans on a regular basis for decades and decades. Some municipalities will even pick up recycled cans from the roadside. Another type of can which you can recycle is the soup can. Typically made out of steel, they can often be picked up by municipal waste management services. Just make sure that they’ve been scrubbed clean before throwing them in the bin. Cans with food particles on them cannot be properly recycled. You might not realize it, but metallic snack bags used for chips and other sweets can actually be recycled. In many cases, you’ll have to submit these to a recycling center yourself. Municipalities won’t often pick them up from the roadside. When we’re finished with it, aluminum foil seems like such an insignificant material that we often just throw it in the trash. However, aluminum foil can be recycled. Before you recycle it, however, you need to ensure that it’s clear of any food. Do you have any ancient, non-functioning bicycles sitting unused in your shed or garage? If so, and if you have no interest in fixing them up, you could consider recycling them. Their metal frames are accepted by all recycling centers, allowing you to get a little cash for something that would otherwise offer you nothing. Perhaps you just bought a new set of tools and are looking to dispose of your old set? If so, you might consider recycling. Everything from wrenches, to hammers, to screwdrivers, and more can be melted down and manufactured into new items. If you’ve got no other use for your old tools, you’d might as well do something good with them. Maybe you’ve been using wire close hangers for years, but have decided to switch to plastic? If so, you’re probably looking to dispose of your old hangers. A good way to dispose of them is by having them recycled. While you won’t get much money out of them, you will at least be able to get them off your hands. Have old dumbbells lying around the house? Looking to get rid of an exercise machine? If so, you’ve got to options: you can sell them to a used sporting goods store, or you can have them recycled. Exercise equipment contains a great deal of steel and will usually yield a fairly large monetary reward when recycled. Have Metal Products to Recycle? Are you attempting to dispose of any of the metal items reviewed above? Looking to have them recycled? If so, and if you live in the Chicago area, we here at Central Metal Recycling are the people to call. 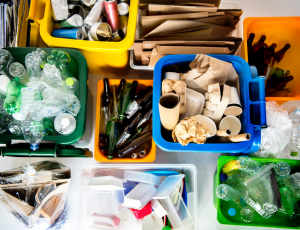 Our team of recycling specialists will consult you on your recyclable items ensuring you know what can and cannot be recycled. We sincerely look forward to working with you.